7 minutes….7 pins: Renovation Edition! My sister bought a house! In the spirit of her renovations I have devoted my latest 7 min…. 7 pins post to all things houses! I hope you enjoy the pins I found and get some ideas for your places and spaces. My sister’s house is small and was in need of a little TLC when she bought it. This first pin shows how some paint, planters, and landscaping can add some major curb appeal to a home! 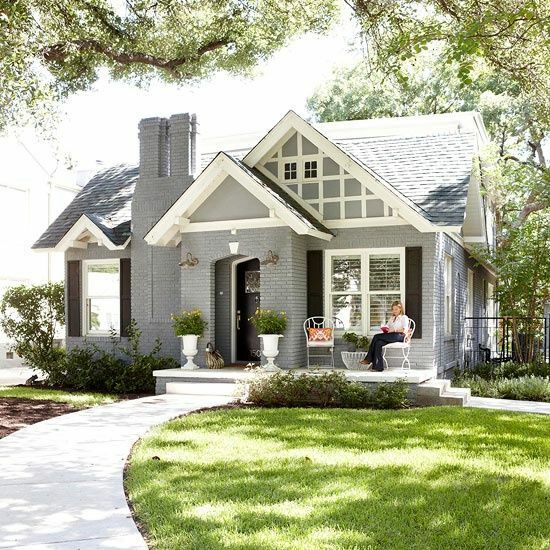 I also love the gray paint and black shutters! This custom closet is any girl’s dream! I am in love with how this one takes advantage of every inch of available space. I know that the Kuzak Closet team will also think of that when designing my sister’s closet! This compact little bar area would be a great addition to Amanda’s home! I am hoping her kitchen renovations allows room for a little wine fridge! The fun tile in this small laundry area makes a big impact! The built in table is also a nice touch for folding and sorting. What a pretty space to do laundry! With only one bathroom in my sister’s new house, she is going to need to a vanity with tons of storage. This one might fit the bill! I love how every door is functional! The one quirky thing about my sister’s new house is that the laundry is outdoors! I am thinking that she will possibly want to hide her appliances. I like the sliding doors in this image! I love this last image of this beautiful kitchen! Like my sister’s new house–it’s not a huge space but the smaller island allows for extra prep space and doubles as an eating area! Win-win! Thanks for joining me for another edition of 7 minutes…7 pins! I’ll be back soon with a Fall 7 minutes…7 pins. Be sure to follow our the Kuzak Closet Pinterest page where there is always something new!